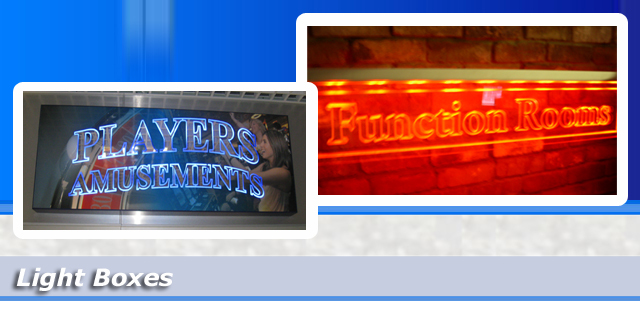 Sign Wizards offer a range of signage light boxes. Lightboxes are an internally illuminated sign. They are fully visible in the day and illuminated at night. Manufactured in house we offer a wide range of styles and in any size. Translucent vinyl’s are used to create the graphics on your light box, but with Sign Wizards in house print shop we have the facility to print full colour graphics for your light box. Light boxes can be used inside and outside. Protruding Lightboxes are fitted at a 90 degree angle to your building and are internally illuminated. They can be single or double sided. They will accept either translucent vinyl’s or full colour printed graphics. Wall Mounted Swing Signs are solid foam panels suspend from a tastefully designed metal bracket fixed at a 90 degree angle to your building. Mounting a swing sign high up onto your building will also attract lots of attention as again they will be seen by each person that passes them. All signs can be installed by our dedicated team of fitters at a time that is convenient for the customer. As you can appreciate, no two customers signs are the same, so supplying us with as much information about the type of signage you are trying to achieve will be highly advantageous, and will enable us to produce exactly what you are looking for! Aluminium Frame is used to hang signs. This also finishes off edges on the sign giving the sign a picture frame effect. Frames are available in standard silver mill finish, but we can powder coat the frame to almost any colour. This is an aluminium panel sign manufactured with returns, to any size. These have the appearance of a tin lid Shape, with no visible face fixings.